Bird’s the word for Noah Strycker. Once named the American Birding Association’s Young Birder of the Year, the 28-year-old ornithologist is a rising superstar in the birding community. He has traveled all over the world—from the Amazon jungle to Antarctica—in his avian odyssey. What’s the fascination? In his latest book, The Thing With Feathers: The Surprising Lives of Birds and What They Reveal About Being Human, Strycker presents essays on 13 birds that reveal a gaggle of intriguing behavioral insights. Ponder the fact that parrots are the only animal besides humans that dance to a beat, or think about how nutcrackers remember the thousands of locations where they’ve buried seeds. According to Strycker, “If you look closely enough, many seemingly incredible bird feats have human counterparts, with interesting lessons.” Snowy owls fly thousands of miles just for the heck of it. In humans, that translates to wanderlust. Albatrosses mate for life, maintaining a lower divorce rate than humans. And if that’s not love, it’s certainly an astounding commitment. At times the connection between bird and human behavior feels tenuous. Strycker spends a chapter discussing how hummingbirds spend all their time flying around so quickly that they become “slaves to speed, desperately fighting for control of calories, so single-minded that they don’t even partner up to raise a family.” He then references studies that display an increase in humans’ walking pace over the past decade in the world’s largest cities and asks, “Do we really want to become hummingbirds?” Sure, why not? If we could fly from flower to flower we wouldn’t have to walk down the sidewalk so darn fast. But let’s not allow a few half-hatched premises ruin an otherwise fun and enlightening read. Strycker knows words as well as birds; he has the literary chops to make the results of very complex experiments accessible. This is especially true in the chapter on the pecking order of chickens, a surprisingly complex and imperfect hierarchy. He relates it to a round-robin tournament in such a way that it makes perfect sense to any sports fan who has witnessed the muddled results of group play in a tennis or soccer tournament. Perhaps Strycker’s greatest achievement in The Thing With Feathers is forcing the reader to think of birds not as flying rats that poop on cars, as my wife defines them, but as animals with superpowers. That is not hyperbole. Homing pigeons have an intrinsic map and compass system. Vultures have a stomach that can kill the deadliest of bacteria. It’s enough to make a human being feel inadequate. We can’t fly or kill botulism with our stomach acid. However, we can read Noah Strycker’s book, which of course, is one feat no bird can accomplish. 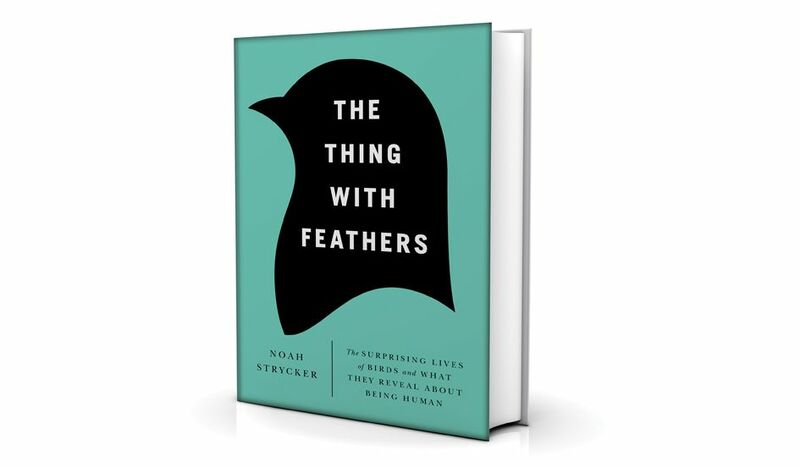 The Thing With Feathers: The Surprising Lives of Birds and What They Reveal About Being Human, by Noah Strycker, Riverhead Books, in stores now.